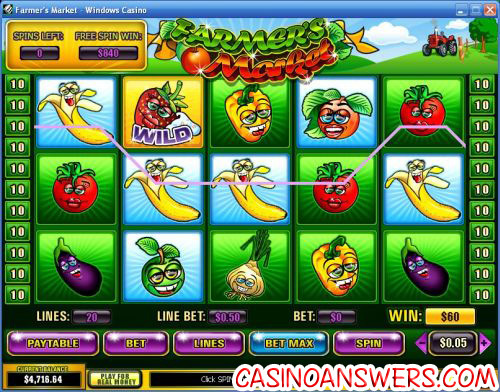 Farmer’s Market Video Slot Guide & Review - Casino Answers! Farmer’s Market is a 5-reel, 20-line video slot developed by Playtech, featuring wild substitutes, scatter payouts, multipliers, free spins and a bonus game. 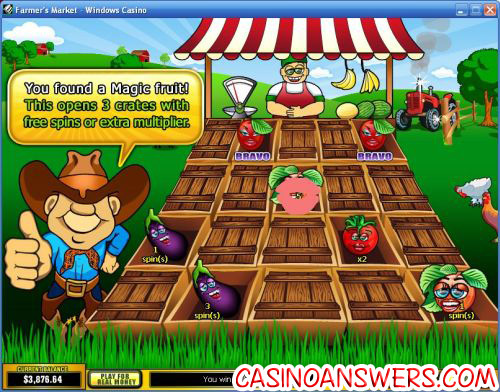 You can play the Farmer’s Market video slot game at Casino Tropez and Casino Del Rio. To win the 5000 coin top jackpot on the Farmer’s Market video slot, you must hit 5 Strawberry symbols on a selected payline. The Strawberry symbol is wild and is counted as any symbol except for the scatter and bonus symbols to complete a winning combination. When you get a winning combination using the Wild Strawberry symbol, the Strawberry will become animated and lick the whipped cream. The scatter symbol on the Farmer’s Market slot machine is the Watermelon symbol. It pays 5X for 3 symbols, 25X for 4 symbols and 100X for 5 scatter symbols. Scatter payouts are multiplied by the total bet and added to payline wins. The Grapes symbol is the bonus symbol in Farmer’s Market. Bonus symbols scattered on the first and fifth reels will start the Farmer’s Market bonus game. The bonus game consists of a 4X5 grid of crates. You must open each crate to win either free spins or a multiplier. If you open a Magic fruit, it will open 3 crates that will contain free spins or multipliers. However, if you open a crate with a Wormy fruit, your bonus game will end and your free spins feature will begin. Only the highest win is paid per selected payline. Winning combinations must be left to right (except scatter symbols). Payline payouts are multiplied by the line bet. Farmer’s Market is a very fun video slot from Playtech. Its bonus game that is also a free spin feature gives you the chance to win a lot of cash if you’re lucky enough to open enough crates. It also has a decent top jackpot. To play the Farmer’s Market video slot, sign up and deposit today at Casino Tropez! Are players from the United States able to play the Farmer’s Market video slot for real money? Unfortunately, American players cannot play at Playtech online casinos at this time. If you’re looking for a cartoonish fruit themed video slot, you might want to check out Juicy Stakes Casino for their Freaky Fruits, Freaky Gym and Freaky Wild West video slots. Where can I play a free Flash game of the Farmer’s Market slot machine? You can find an Instant Play Flash game of Farmer’s Market at both Casino Tropez and Casino Del Rio. You can play for free or for real money. If you experience any issues playing the Flash version of the Farmer’s Market video slot, try downloading the latest version of Adobe Flash Player. What playtech casinos have the farmers market video slot?